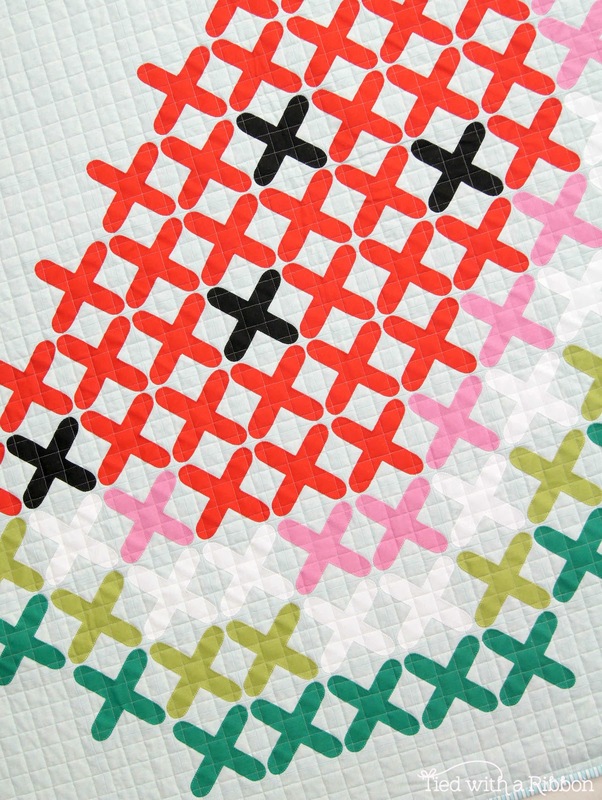 Its funny how the little things in quilting can be overlooked! 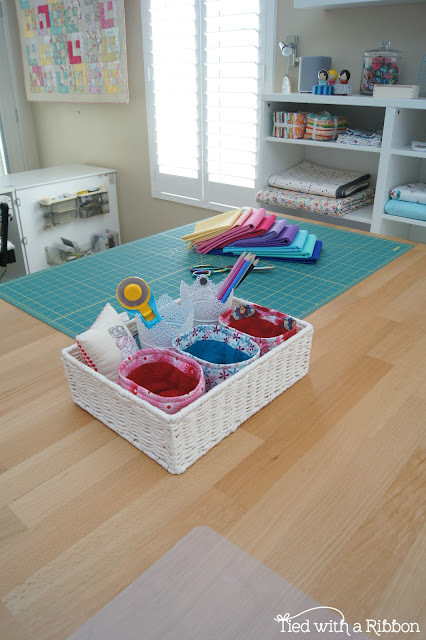 I teach lots of students how to Quilt and sometimes it those "smaller" tips or the things you think people know how to do, that students find often the most helpful. 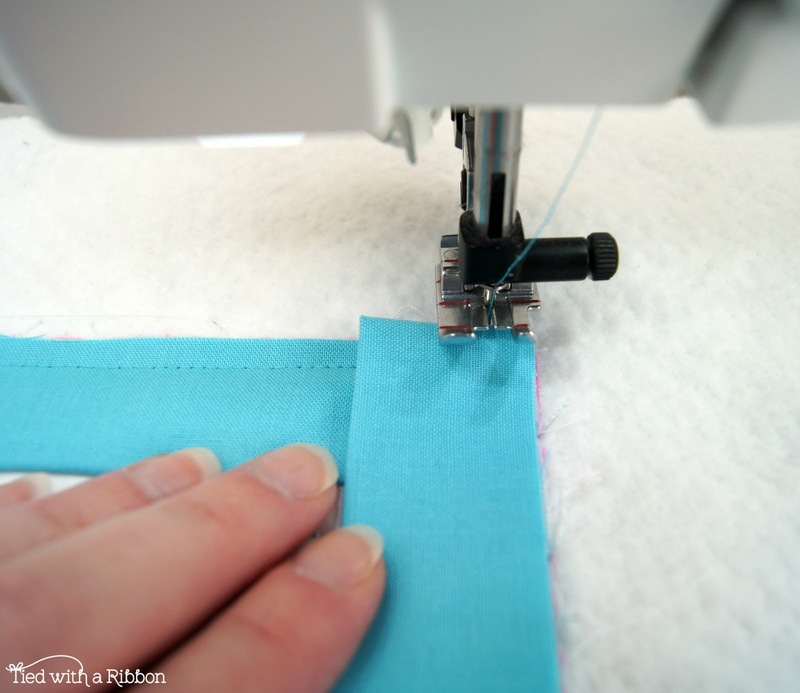 When I teach and show students about "How to sew your Binding - continuously around the corner" this always raises eyebrows and usually big gasps of "why didn't I know this!" After sharing this tip the other day on my Instagram Stories - (@tiedwitharibbon) it turns out that a lot of people didn't know this little trick so I thought I would share it with you. 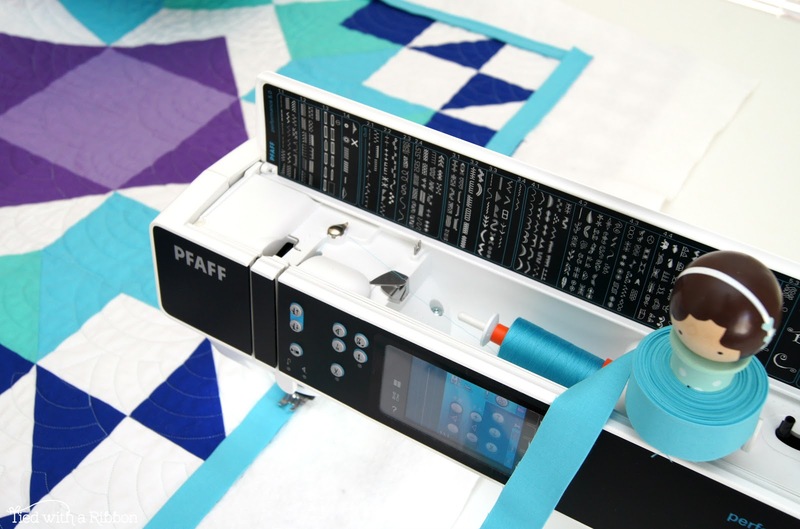 Note: I prefer to sew the Binding onto my Quilt with the batting and backing excess still as one piece - I don't trim this off before binding and I have even asked my Quilter not to trim the excess batting and backing of my quilts so I can Bind them this way. I also like to colour match my thread! 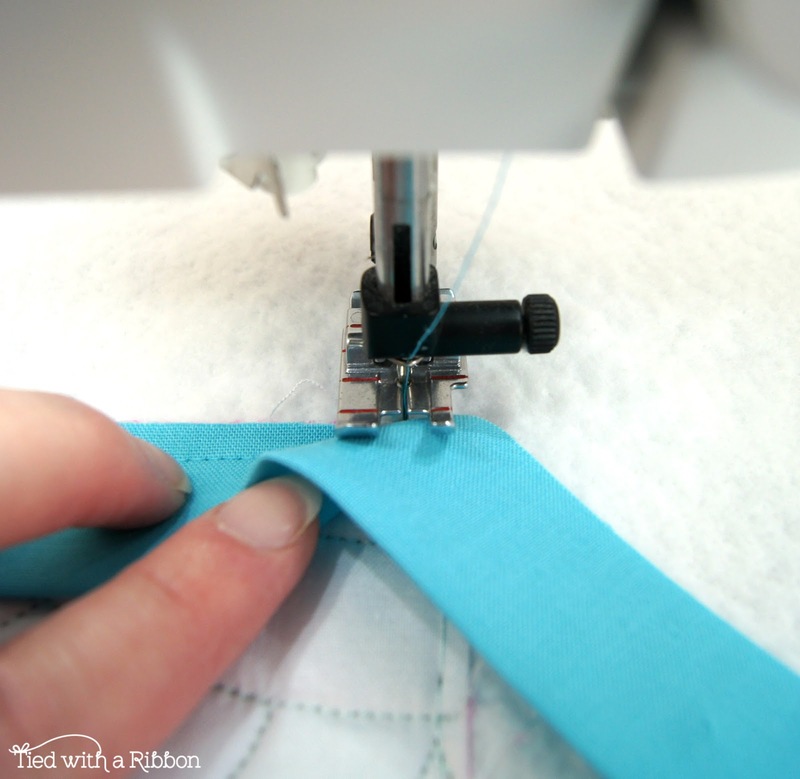 Use threads to blend with the Top Thread to match the Binding fabric colour and the Bobbin Thread to match the quilt Backing fabric colour. 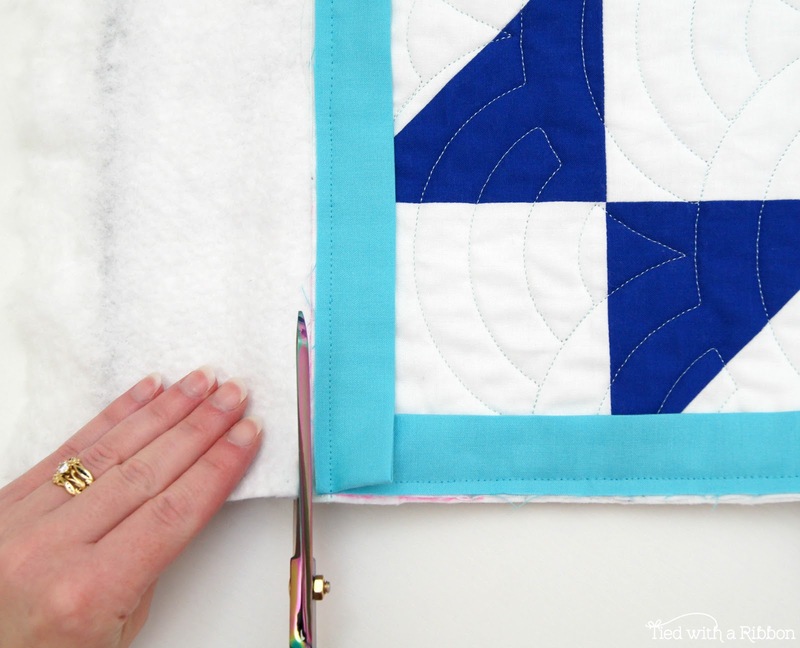 Step 1 - Use an Erasable Fabric marker to square up your quilt by marking a line around your quilt that makes the quilt Square, making sure to take into account your 1/4in seam allowance. Step 2 - Starting along one side of your Quilt take your made Binding and sew the Binding strip to the right side of your quilt. 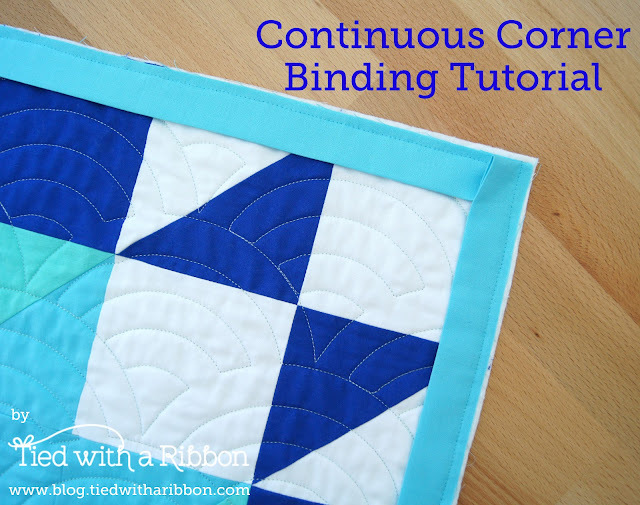 To Mitre your Quilt corners in one continuous sequence stop 1/4in before you reach the corner of your quilt. 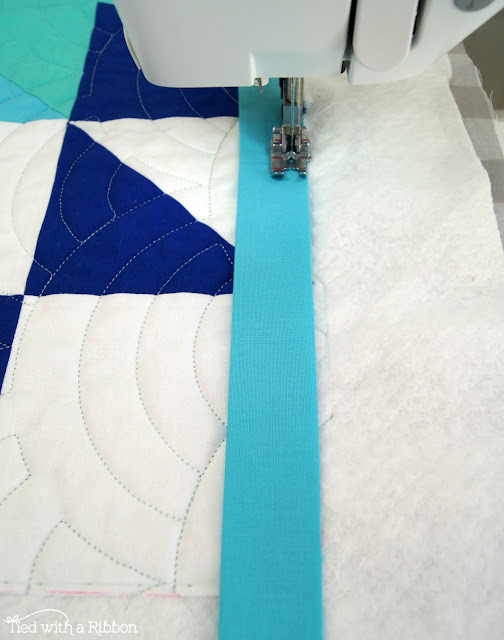 Step 3 - Put the "Needle Down" into the quilt, lift the Presser Foot and rotate the quilt around 90 degrees. Place the Presser Foot back down. Step 4 - Reverse Stitch back to the edge of the quilt top (I find this is about 3 stitches on my machine). Place your "Needle Down" again. 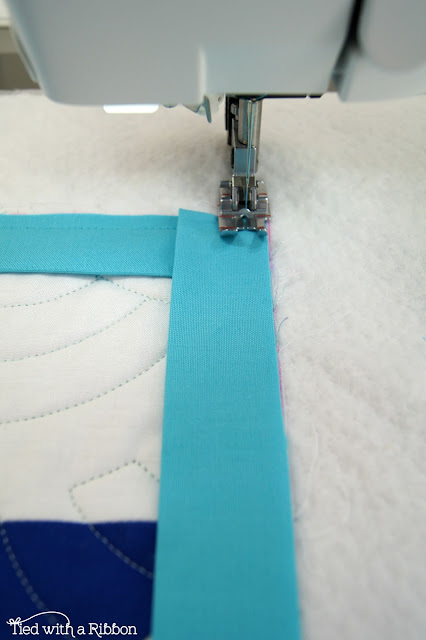 Step 5 - Lift your Presser Foot up and fold the binding at a 90 degree angle away from your Quilt top covering the angle you have created. 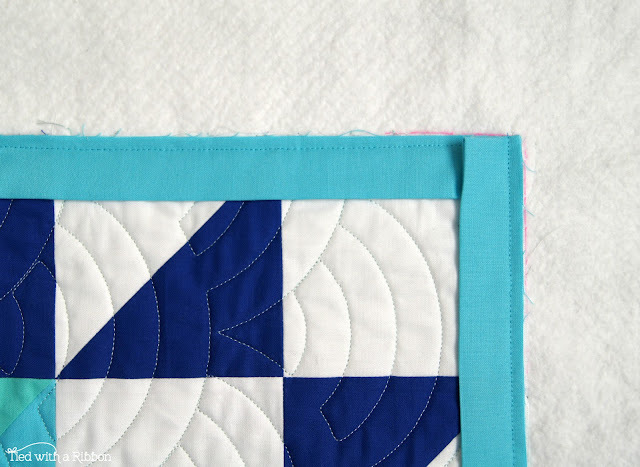 Step 6 - Line up the raw edges of your Binding along the raw edge of your Quilt top. 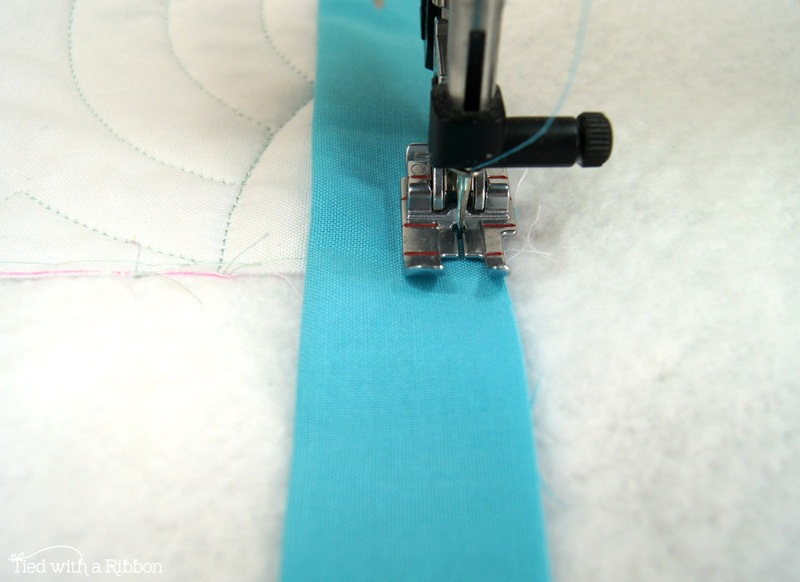 Place the Presser Foot back down and sew along the next side of your Quilt. Step 7 - Continue to sew your binding all the way around your Quilt. 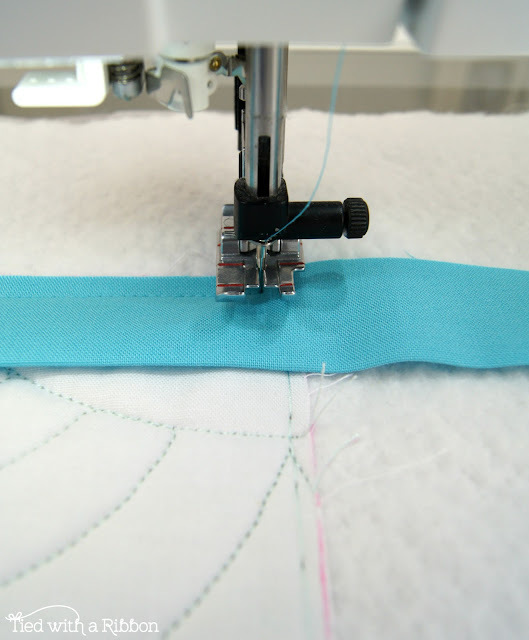 Once you have sewn it all the way around you can then trim the excess batting and binding. 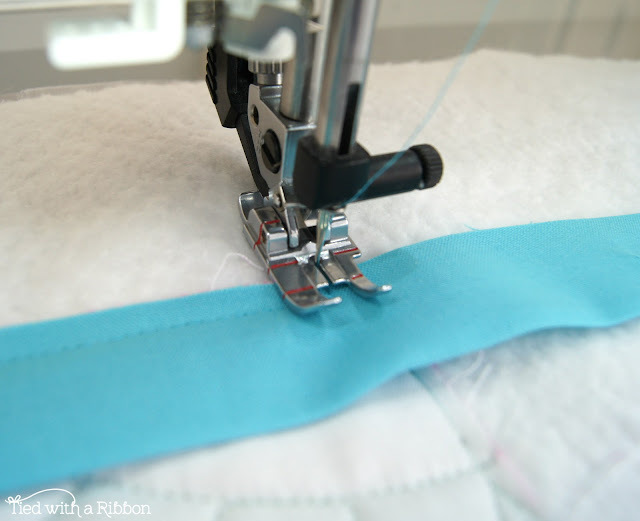 The reason I do not trim this before binding is so that you can leave enough to fill to the centre binding line, before being folded over and sewn to the back seam line of your quilt. 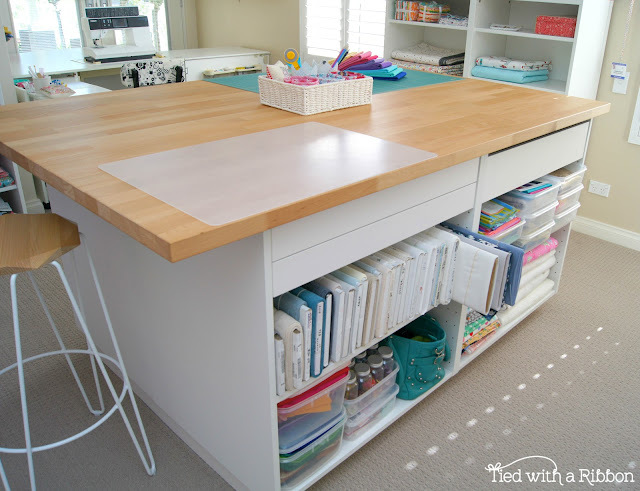 I hope you find that Helpful - leave a comment below. 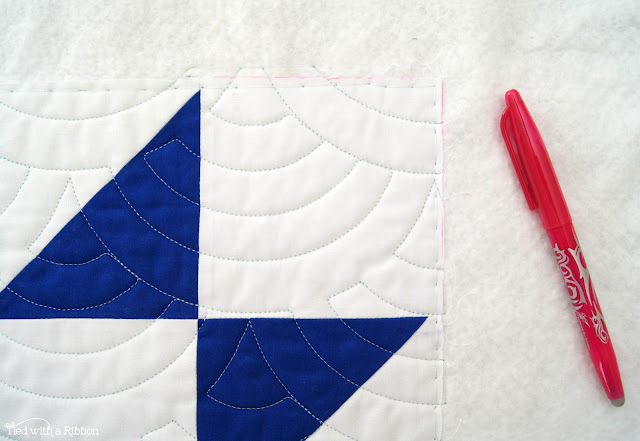 I'd love to know what tips and tricks of quilting you would love to find out about. 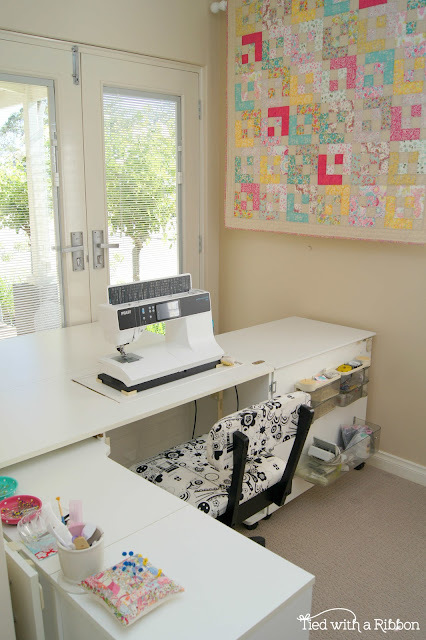 PS - Thanks to Carol Brady of The Quilting Cottage for your awesome Long Arm Machine Quilting of this quilt. I have to admit that as a pattern designer seeing my designs made by other's never gets old and makes me so grateful to have been able to turn my hobby into my full time work. 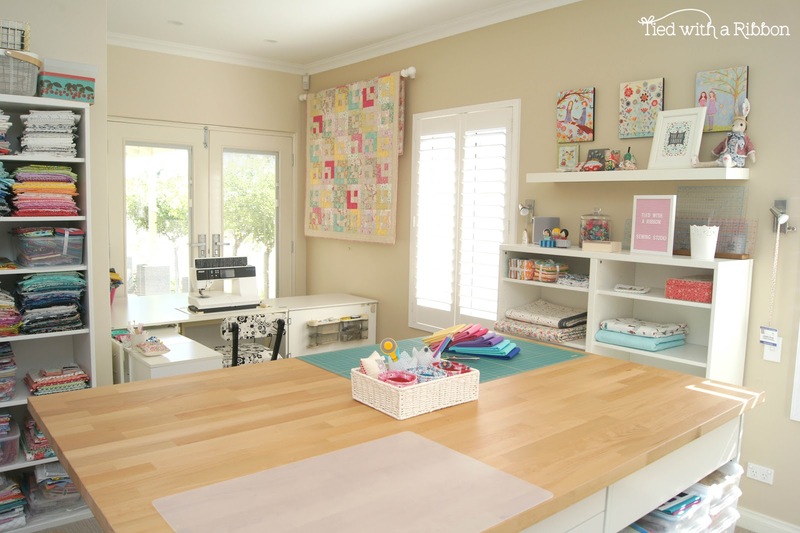 Since my Sewing Room Makeover its like I have had a whole new lease on my "sewjo" and I have been busy designing so many new patterns that I will begin to release as the year begins. 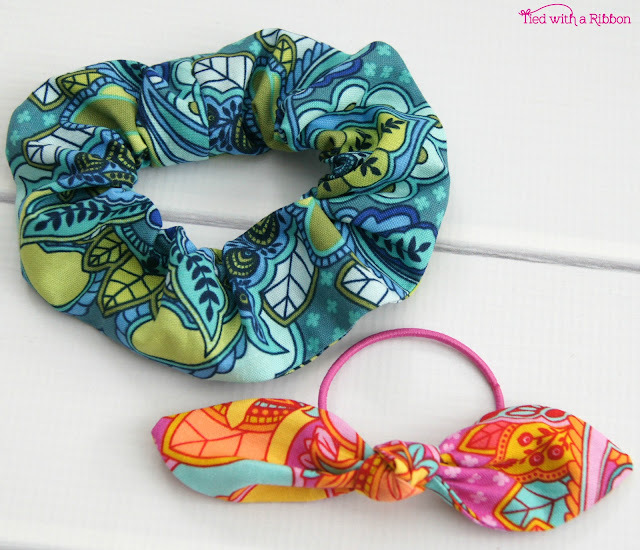 But before we get started with new designs I have a few of my latest releases to share with you today. 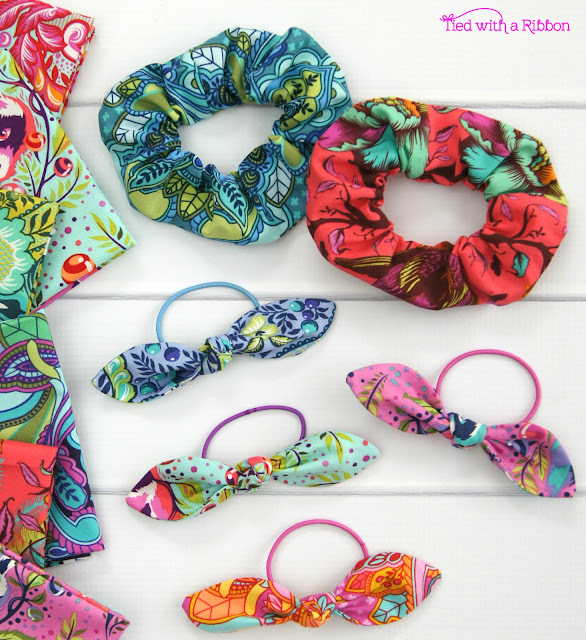 Introducing "Hair Dayz" - it is a Creative Card pattern (double sided A4 page format) which has both the pattern to make Scrunchies and these Hair Ties. Yes you heard it - Scrunchies are officially making a come back.!! When my own two girls were in Primary School I used to cut up their old school Uniforms and then re-sew them into these Hair Ties. Originally just for my own girls - but the other school mums soon went crazy for them and I couldn't keep up at one point. I have made these also over the years for many of my friends little daughters and are great to use up scraps or lots of bright colourful fabrics. 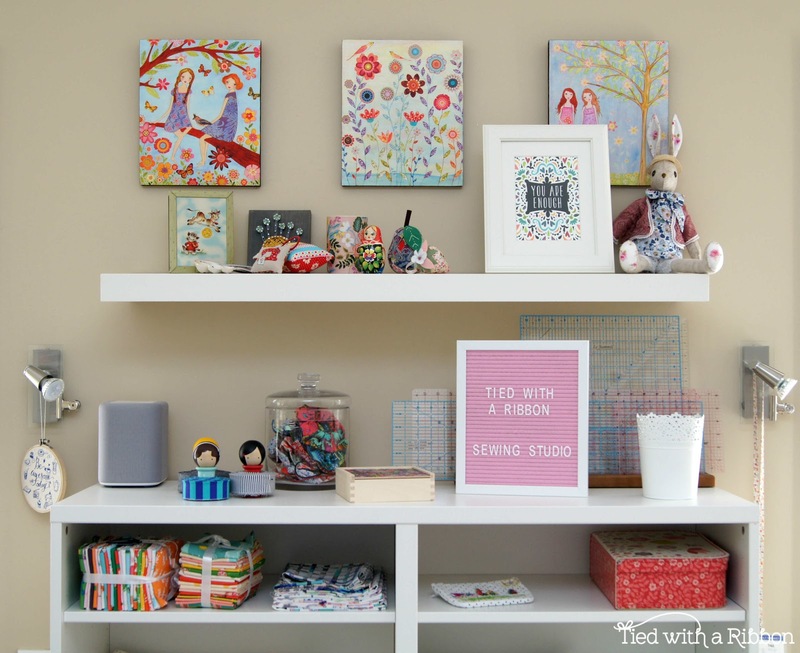 They make great gifts bundled together and the kids (and bigger kids!) go mad for them. 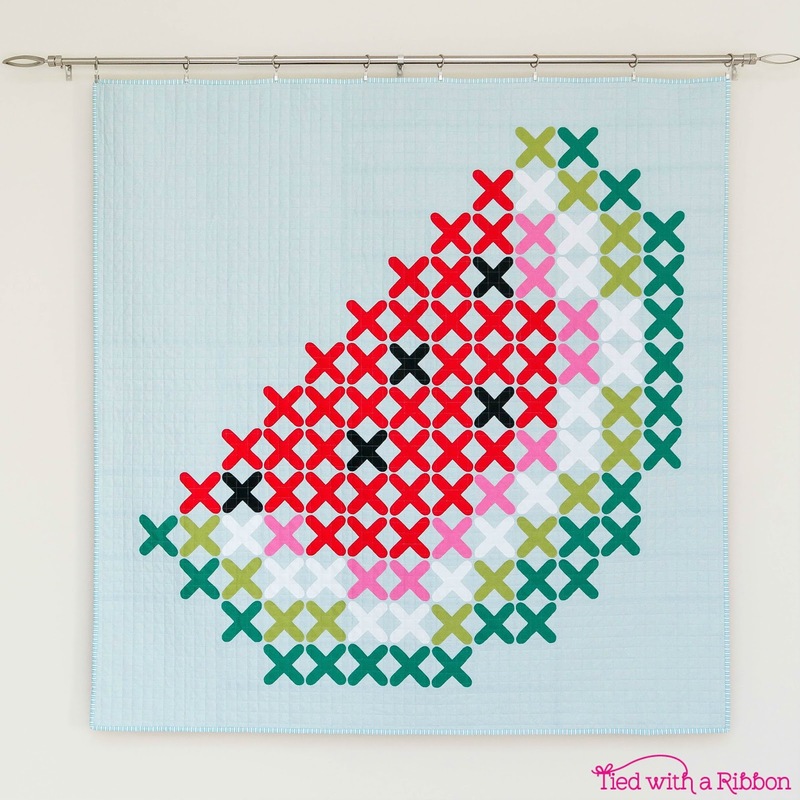 Following on from my Viv's Rose Quilt - this new Applique Cross Stitch inspired quilt is named "Watermelon Crush" and is all about summer fun! Ive teamed up Robert Kaufman Solid Linens and this Essex Linen in Aqua for the background to let the design shine through these solid fabrics. 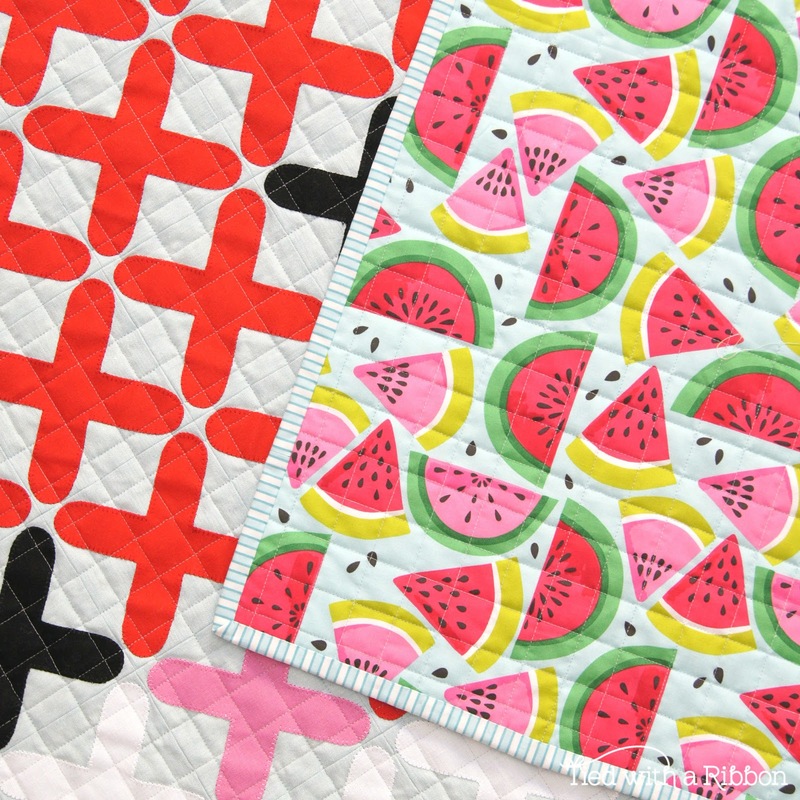 And of course I couldn't go past using this Watermelon Smash fabric from Maude Asbury to use as backing. 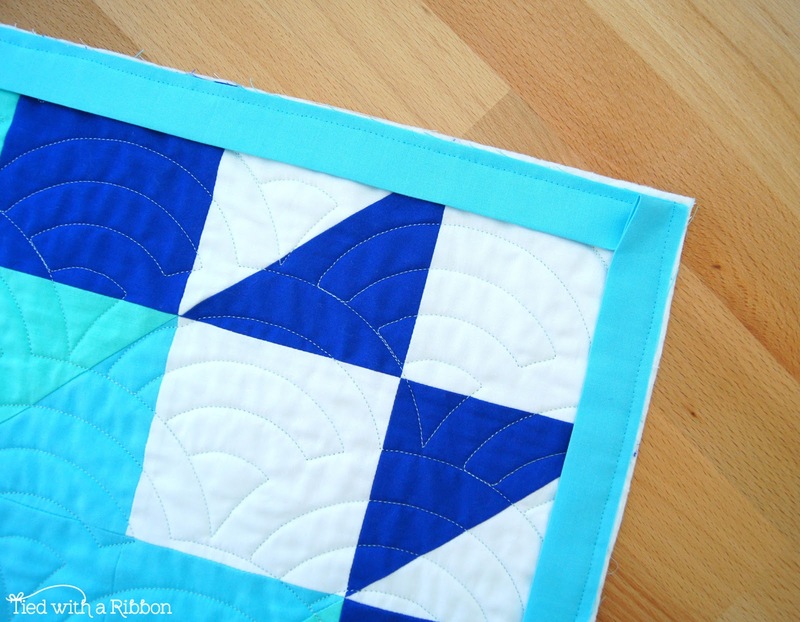 I am very much a believer in not just putting any backing on a quilt but using a more considered and thought out approach to add to your quilt rather than just see it as the "back". I carefully patterned matched the design and I love the back as much as the front in giving this quilt that perfect finishing touch. 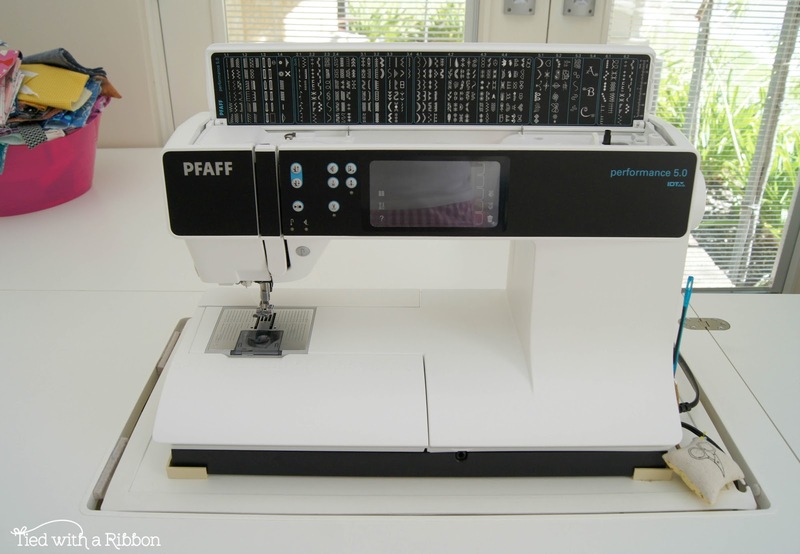 And while we might have only just celebrated Christmas its never to early to get sewing to be well ready and inspired come this festive season. "Here Comes Santa" is a Pillow set featuring a machine pieced Santa pillow and an Applique "naughty or nice" pillow. 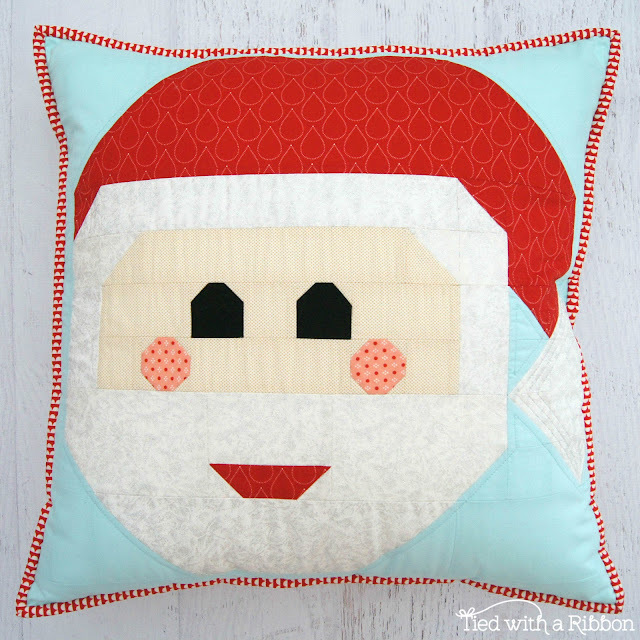 Both are included in the pattern so you can decorate your favourite spot for the Holiday season. 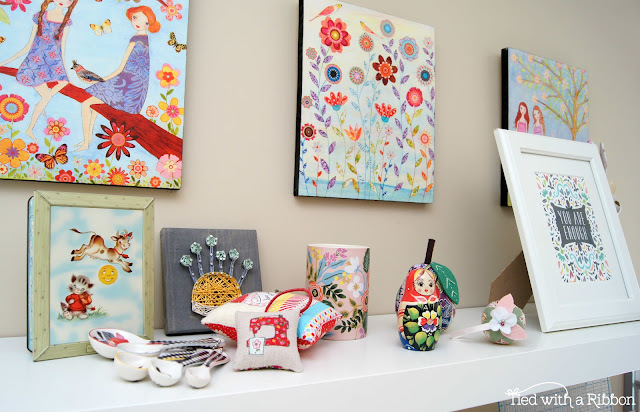 Pillows are great to add some sparkle to your decorating or to gift at this time of year. 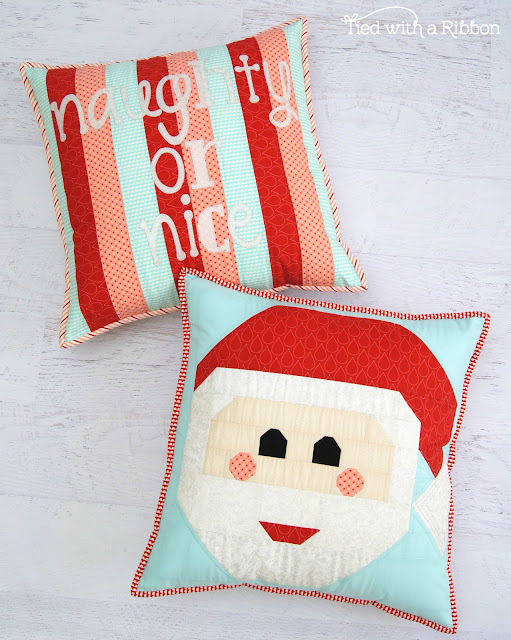 Use fabrics from your stash as I did in this set (using mostly Bonnie and Camille fabrics) or your favourite Holiday range. 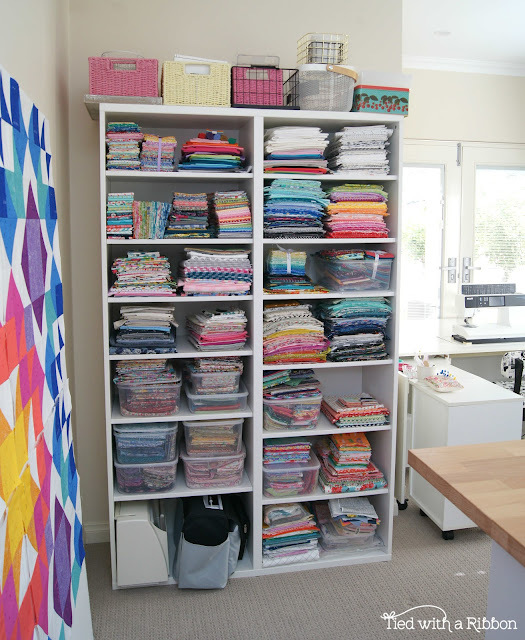 As with all my patterns to - if you are a wholesale customer then all my designs can be found over at Creative Abundance here in Australia and through Checker Distributors over in the US. I can't wait to share more with you this year with many quilts already literally, being quilted and more new designs being sewn up to inspire you to quilt, make, create and sew.